I used the Autonomous Robotic Telescope on Mount Teide- Tenerife to capture this image of the Super luminous Supernova SN2017 egm –( Wednesday 4 October 2017 (05:20:33 UTC) – 1x120000ms – BVR filters) - in the barred spiral galaxy NGC3191. 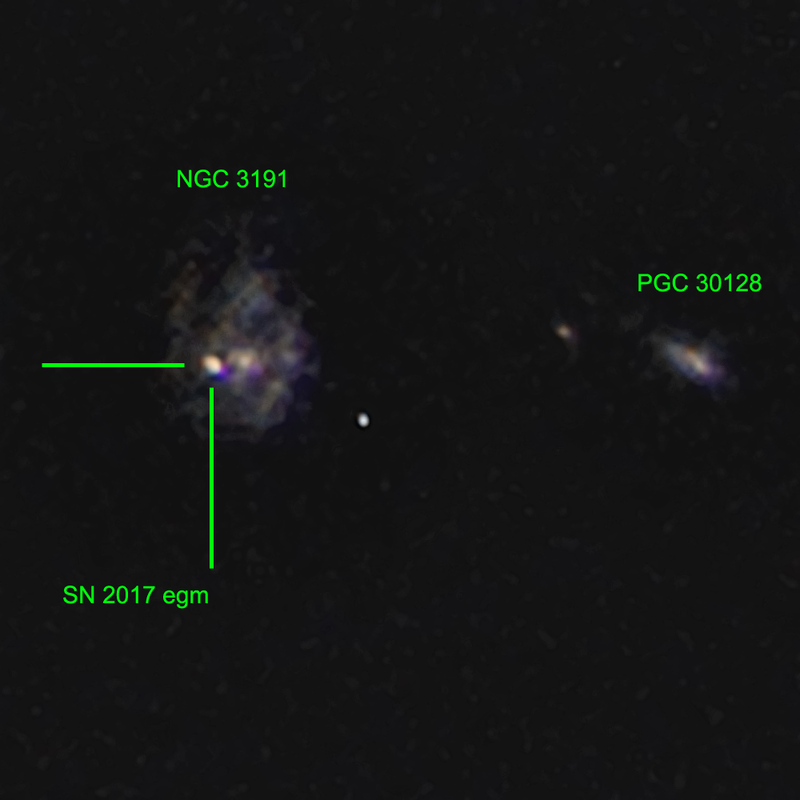 According to the information I have read on the Internet, SN2017 egm is the nearest super luminous supernova ever detected. Its progenitor is believed to be a millisecond Magnetar created in a hypernova and on the collapse of a massive star. Fast spinning neutron collapsed star core’s are thought to be one of the causes for the generation of long duration Gamma Ray Bursts (LRGBs). NGC3191, located in the constellation Ursa Major, is estimated to be 420 million light years distant and magnitude assessments have estimated that the luminosity of the hypernova exceeded the combined luminosity of our Milky Way Galaxy. NGC3191 is interacting tidally with its companion galaxy an arc-minute or so to its west.